I wanted to share the story of my aging pit bull mix Tembo, since he's the love of my life! I adopted Tembo in 2007. He had been at the small upstate NY animal control facility for 7 months, being passed over due to his "breed." He was infrequently walked and sleeping on concrete. When I met him, I knew that with exercise and routine, he would be lovely. Well he is more than lovely, he's perfect. He is kind, sensitive and sweet. Tembo is good with dogs, cats, and everything in between. This New Years, Tembo began having trouble using his back legs. When orthopedic disease was ruled out, MRI and CT scans were performed. Turns out he has 4 slipped discs in his back, making the signal bad between his brain and hind legs. Tembo is now is on pain and anxiety medications, goes to acupuncture and laser therapy once a week, and has daily physical therapy at home. 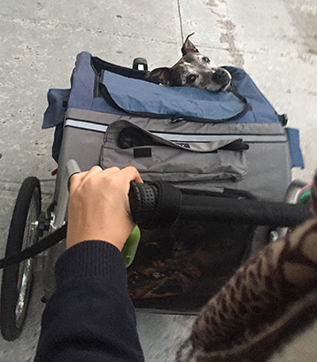 Yesterday, Tembo took his first spin in his new stroller. Because he can't walk very far distances, he can now come on longer walks with his younger sister Laika and enjoy the view and fresh air. Tembo and Laika are inseparable. They have a true bond and as Tembo ages, she has been very gentle with him.